It is human nature to want to take sides when you perceive there to be a conflict, and in the EA versus Activision video game publishing war, the recurring battle pitting their FPS franchises against one another is one of the favourite conflicts of the gaming landscape. Last week saw this year’s protagonists being revealed within days of each other, and I thought I would share the numbers we have gathered on the two games, alongside with the data related to the video reveals. 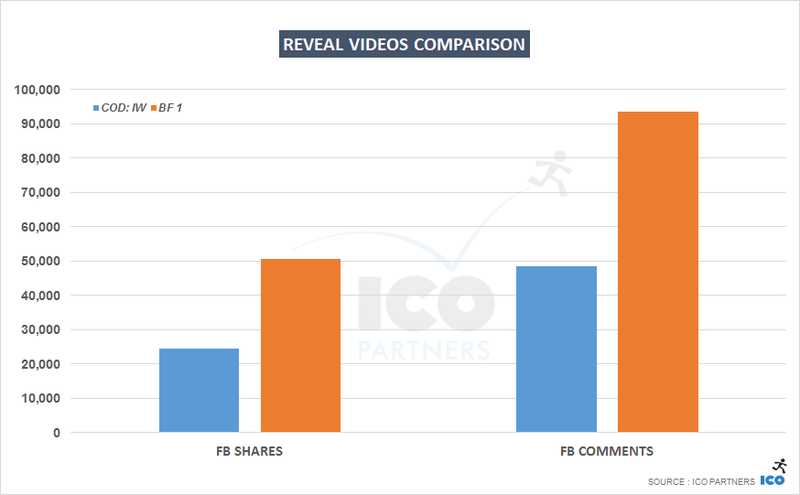 To understand the different results, it is very important to look at the context of each announcement. The name was first leaked through a listing on the PlayStation store end of April, alongside further leaks about a remastered version of Call of Duty Modern Warfare. The proper reveal really happened on the 2nd of May (Monday last week). Battlefield had made a pre-announcement the 29th of April, announcing the date of the reveal for the 5th of May (Friday last week) at 9pm BST. Included in the coverage was a number of speculations around the setting of the game due to leaks of materials related to the event on the Friday. Basically, there were hints of both game reveals (the exact time and date for BF1) ahead of their video reveals. Let’s look at the number of articles first. As a reminder, I am using our media monitoring tool for this. 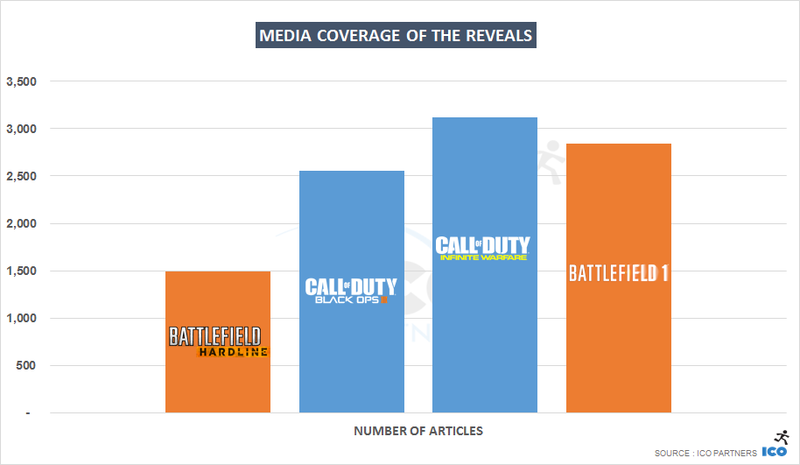 As Battlefield 1 announced late on a Friday, it probably suffered a lot from a coverage perspective. I would usually compare an announcement over the first 2 days, but clearly, that was not representing fairly the actual coverage for that game. So this time, I looked at the first 5 days, from the moment the reveal trailer was available for each game. Despite having gone through a weekend, Battlefield 1 is still quite close to the Call of Duty: Infinite Warfare numbers. But even for media, this doesn’t tell the whole story. 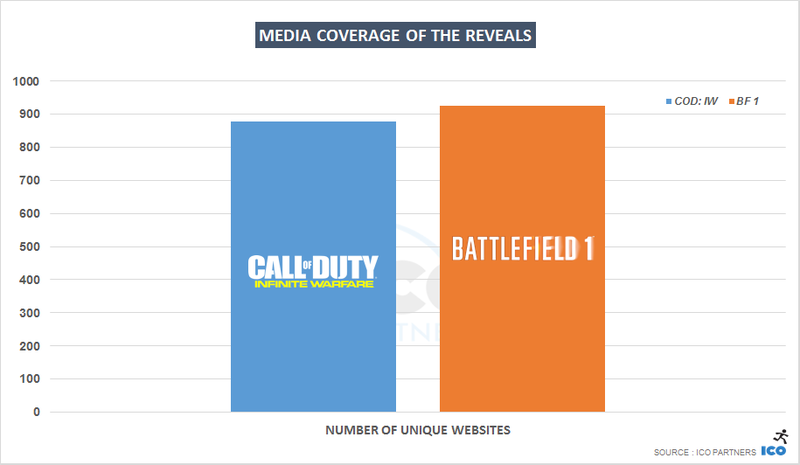 Looking purely at the unique number of websites covering each game, Battlefield 1 is slightly ahead. Considering the power of each franchise, Call of Duty being the regular better seller between the two, this is quite an achievement here. Both games have been incredibly well covered though, it is fair to say. As my interest often lies with European specific issues, I dug a bit further to find out where the discrepancy came from. 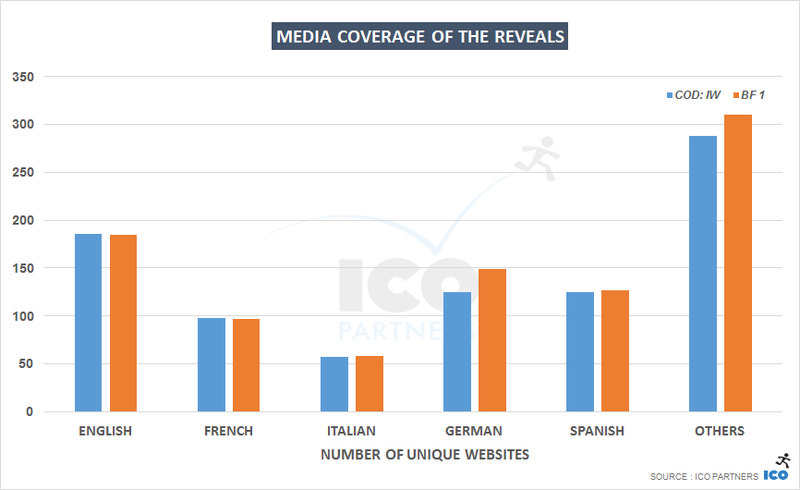 We have a negligible difference in numbers for English, French, Italian and Spanish. Where the difference lies is with German websites, and that very wide “Others” category which is mostly websites from Eastern Europe and Russia. 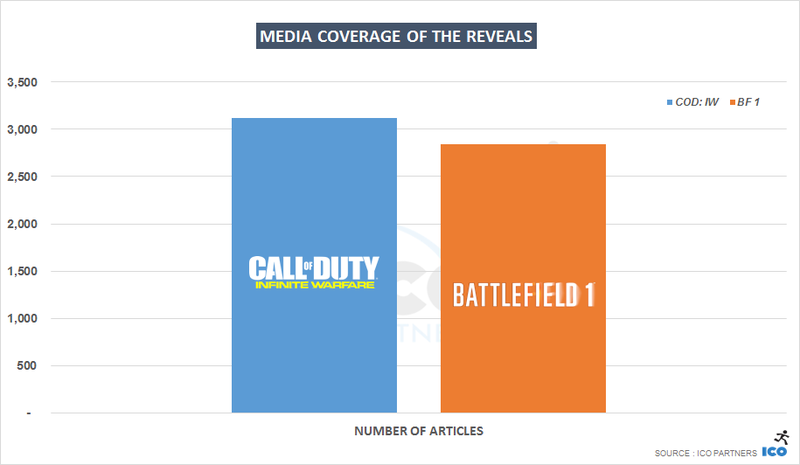 Over the weekend, there was a very interesting article link to the Forbes article titled “‘Battlefield 1’ Is The Most Liked Trailer In YouTube History, ‘Infinite Warfare’ The Most Disliked“. I encourage you to read it, I will mostly share similar data points here (post-weekend numbers though) to put them in light of the media coverage numbers above. 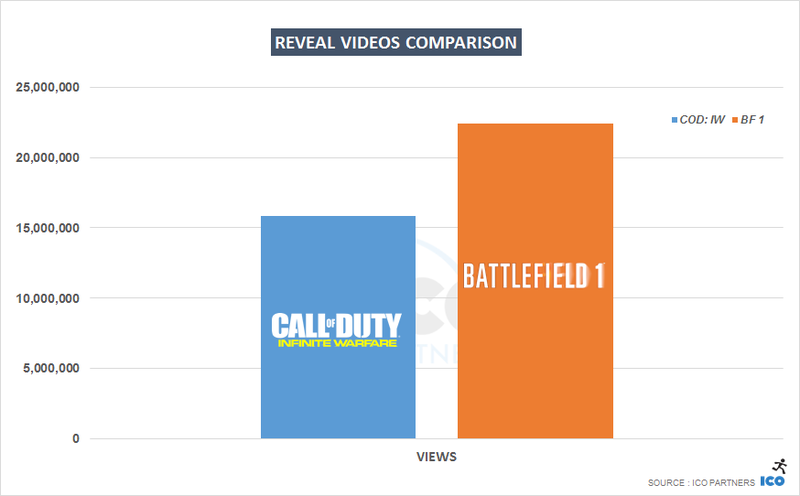 Both videos have received an insane amount of views, but despite a head start of almost 5 days, Call of Duty: Infinite Warfare is falling short of the Battlefield 1 numbers. 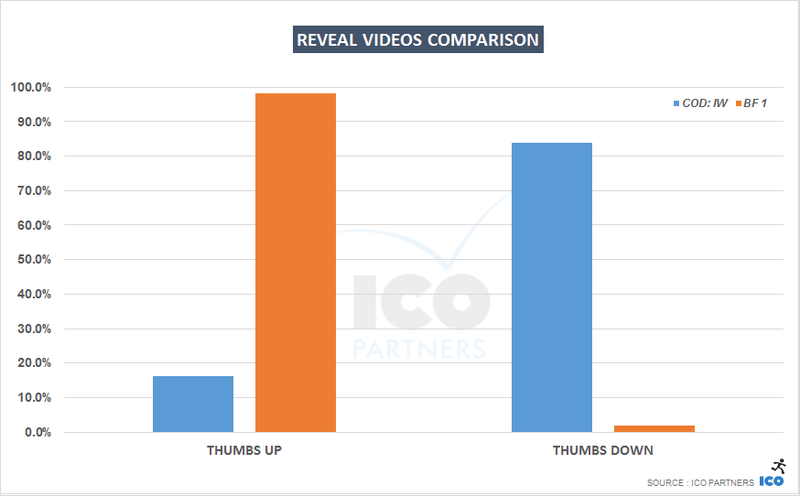 The comparison for the “likes” and “dislikes” on Youtube highlight a very clear division between the two. 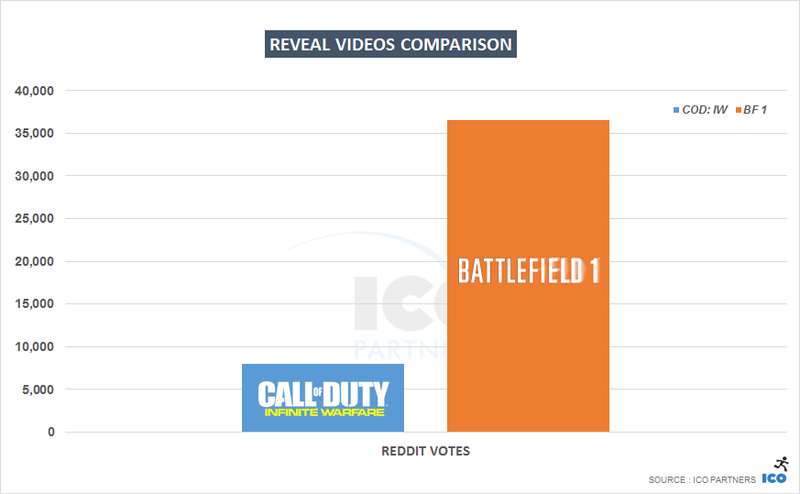 There is a very clear statement of which video is more popular beyond the views, with Call of Duty: Infinite Warfare having almost as many dislikes as Battlefield 1 has likes (in terms of the percentage of overall sentiment). This is only the first part of this year’s confrontation, but it is quite an interesting one as the timing really puts them in a head-to-head position from which comparing their relative performance is quite easy. But we shouldn’t lose perspective on the fact that both games actually got a massive amount of visibility. While we are not quite at the level that Fallout 4 had for its pre-E3 reveal (almost 3,500 articles over the same 5 days period), this is still quite close. Since we have been tracking those two franchises (from early 2014), these two announcements were both the biggest (probably for very different reasons), which is quite promising for things to come.